Meet the Clinique's experts to find out about what's best for your skin. Receive a Limited Edition Clinique Overnight Bag when you purchase RM290* and above in a single receipt. 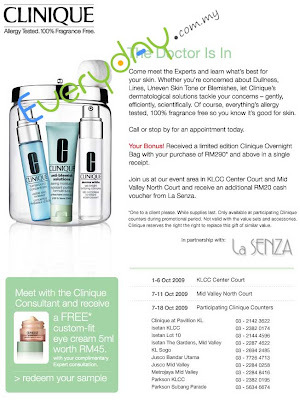 Redeem for a FREE Custom-Fit Eye Cream 5ml worth RM45 when you meet with the Clinique Consultant and get your complimentary expert consultation. Receive an additional RM20 cash voucher from La Senza when you visit their event area at KLCC Centre Court and Mid Valley North Court. * Only available at participating Clinique counters during promotion period.